The Basin Characterization Model (BCM) is a mathematical computer model that calculates the hydrologic inputs and outputs of a specific landscape area (fig. 3) and is generally run at a monthly timestep for large regions, although daily models have been developed for small watersheds. Scientists divide the landscape into grid cells, each of which uses specific climate data inputs, such as precipitation and air temperature, to solve the water balance for each cell. 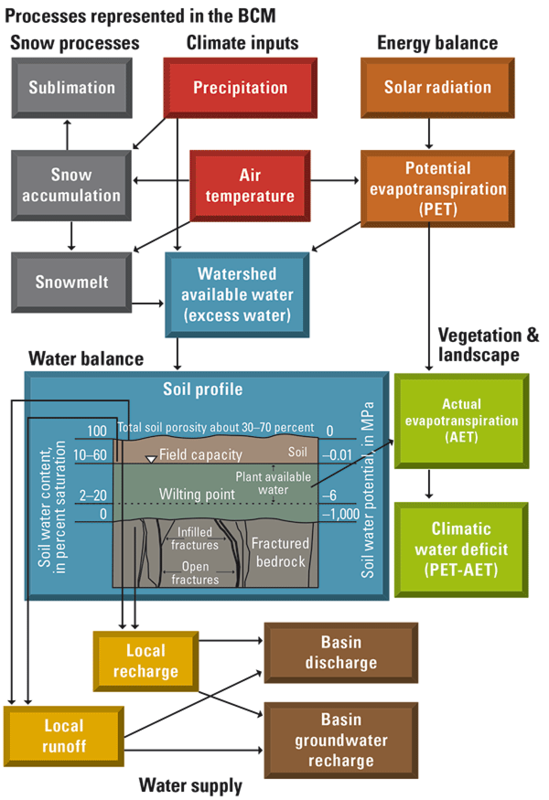 Model calculations include potential evapotranspiration, calculated from solar radiation with topographic shading and cloudiness; snow, as it accumulates and melts; and excess water moving through the soil profile, which is used to calculate actual evapotranspiration and climatic water deficit—the difference between potential and actual evapotranspiration. Depending on soil properties and the permeability of underlying bedrock, surface water can be classified for each cell as either recharge or runoff. Post-processing calculations are made to estimate baseflow, streamflow, and potential recharge to the groundwater system for watersheds. The model output can define the water balance for any size polygon representing regions or watersheds, or can define the distribution of the various water-balance variables across the landscape.